Firstly - well done! You've just signed up for a team using what we think is the best team management software on the planet. Of course, we're quite biased, but you're on the right track. Here's some things that we'd look at doing whilst we're setting up. Mobile Phone Number - this will allow your team members to text or phone you from the app. They've probably got something important to say if they're looking to contact you - so make their life easier. It's the number 1 grip of team managers - that the players/ parents don't always help them out. Don't be that person. Medical Information - if you or a child has something you think a coach might need at training / game day - great place to add it. Only coaches / managers see this information. Name - make it obvious who this is. Your team mates will see this - so if you have lots of Sam's in your team - maybe you want to add it as 'Sam H'. By the way - when you're editing details - look for a pencil icon. For example - if I wanted to change Sam's name to Sammy - I'd hit the pencil icon highlighted below. Whilst we're here - you might want your partner to share the same information that you see. Get the same emails, see the same schedule. Here's the place to do it. Look under the profile of your child, and click on the rightmost icon. Now on the left you can add another parent. Add as many as you need. Perfect for families of any combination. If you don't have Android or iOS ; or just really love to get text messages - well we support that too. Buy yourself a bundle of text messages - and we'll send notifications to your via text instead of push or email. In the Account Settings on the web - under Notification Settings, you can tell teamstuff what notifications you want - when you want them and how you want to get them. A game reminder in email coming out 3 days before the game. No problems - you can do that. Calendar Integration I hear you ask? Why of course not - we can sync to practically any calendar by publishing your entire sporting schedule to your calendar. Look under account settings. Whilst we're in Account Settings - get your privacy set up. We totally respect your privacy - your details are by default shared only with your team. They are never, ever, ever shared outside a team ( or a club ) that you have chosen to be a part of. 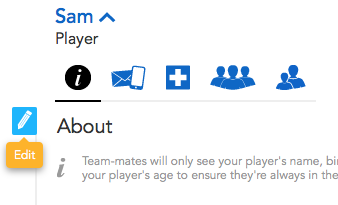 But - you can also block team mates ( players and parents ) from seeing your phone numbers if you don't want them - just turn it on in your Privacy Settings online. Teamstuff is way, way better mobile. We support iOS and Android natively, Blackberry with emulation ( app store - search for "teamstuff" ). Get the app and login. You'll wonder how you ever lived without it! The mobile experience contains all the tools you need to get to games, see who's coming, update game scores or places - even drop players and add new ones. It's also got some pretty nice features - you'll get messages and reminders direct to the app. Go landscape and find out everyone in your team. And touch your profile pics to get some sweet tools for getting gorgeous shots of your and your kids into the team. Why - so that the other parents and kids will know you of course! Last Tip : Get ALL your teams onboard! If you have multiple games to attend to on a weekend ( in my house it's hovering around 8 per weekend ) - then you really, really want all your schedule in the one place. All teams, all games, all kids - and teamstuff is exactly the right tool for it. Good luck for your weekends - we can't help you drive from place to place, but we sure can help you know where you're going!